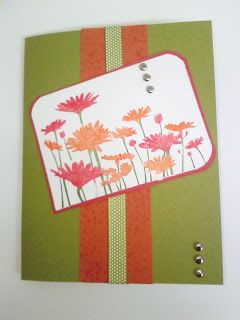 ... was the color challenge for Latenightstampers, a Yahoo Group I belong to. I was confident that this was going to be easy.. simple enough, afterall those are fall colors... colors in which I had limited supply of... so yes a challenge it was! First please excuse the pictures, since its getting dark out so early, I wasn't able to capture it in great light. Still working on getting a photobox. 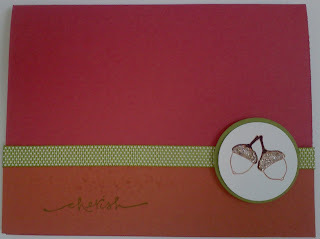 So here is Upsy daisy water misted with Ruby Red and Real Rust markers. I added brads since I thought it needed something. The Old Olive ribbon was included in the Elements pack of ribbon, which I wrapped around the Real Rust CS after I rolled the specklers roller across it in Real Rust. Second, I did about a dozen of these alternating the base color. I am not crazy about the glitter that I added, so I only added it to one. This is the acorn from Autumn Splendor. 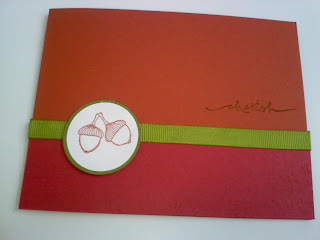 Again, I used the specklers roller on the bottom cardstock althought you cannot see that in these photos. I popped the acorns up on dimensionals and turned the ribbon over for the plain side on the other cards.